3 Are Black Beans & Lima Beans Good for Your Diet? 4 What Are the Benefits of Great Northern Beans? Red-skin potatoes aren’t simply a starchy side that pair perfectly with any entrée. They’re also jam-packed with fiber, vitamins and plenty of minerals. While red-skin potatoes are indeed a healthy addition to your meal, they are high in calories. Depending on their size, you may want to limit yourself to one or two red-skin potatoes, if you’re watching your calories. A medium-sized red-skin potato, which is 2 to 3 inches in diameter and weighs about 6 ounces, provides roughly 155 total calories. You might be surprised that this same potato has 4 grams of protein, amounting to 16 calories from protein. A minimal 2.5 calories come from the 0.3 gram of fat. As you probably suspect, the majority of calories are from carbohydrates. The final 136 calories are from those 34 grams of carbohydrates. While all potatoes are notorious for their high starch content, they’re also full of fiber, another type of carbohydrate your body doesn’t breakdown. Because it doesn’t fully digest, fiber doesn’t contribute any calories to your diet. Instead it sweeps out your gut, pushes out waste and stabilizes your blood sugar and cholesterol levels along the way. To reap all of the perks of fiber, you need to get 14 grams for every 1,000 calories you have in your diet, notes the Dietary Guidelines for Americans 2010. If 2,000 calories daily is typical for you, that medium red-skin potato accounts for 11 percent of your recommendation, providing 3.1 grams of fiber. Red-skin potatoes are a powerhouse of multiple vitamins. You’ll get 22 milligrams of vitamin C, or over 25 percent of your daily requirement from a medium red-skin potato -- men need 90 milligrams daily, while women require 75 milligrams, according to the Food and Nutrition Board at the Institute of Medicine. Vitamin C is essential for immune health and keeping your skin in tip-top shape. A medium red-skin potato gives you nearly 50 micrograms of folate, helping you get about 13 percent of your 400-microgram-per-day recommendation. Folate is a type of B vitamin that aids in creating new cells throughout your body. 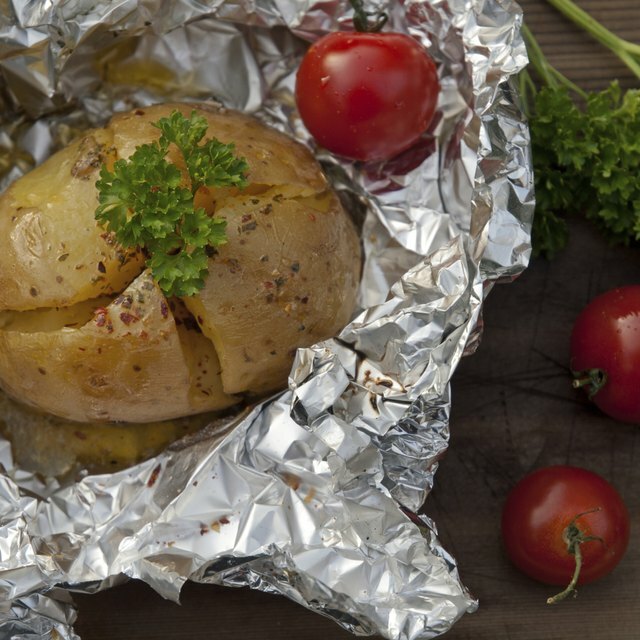 Red-skin potatoes even give you 2.7 milligrams of niacin, which is over 16 percent of your recommendation. Niacin is one of the B vitamins that plays a big role in metabolizing your meals. Men need 16 milligrams of daily niacin, while women require 14 milligrams. You’ll get an astounding 20 percent of your potassium recommendation for the day by enjoying just one medium red-skin potato. Potassium is essential for a steady electrical flow for your heart rhythm and muscle functions. Aim for 4,700 milligrams of potassium every day -- 945 milligrams of that can come from your medium red-skin potato. To help keep your bones strong, a medium red-skin potato has 125 milligrams of phosphorous. This is nearly 18 percent of your 700-milligram daily requirement. Your favorite starch even offers magnesium for blood health, additional bone support and a slew of biochemical reactions. A medium red-skin potato provides almost 50 milligrams of magnesium, which is a big chunk of the 420 milligram daily recommendation for men, or 320 milligram daily recommendation for women.